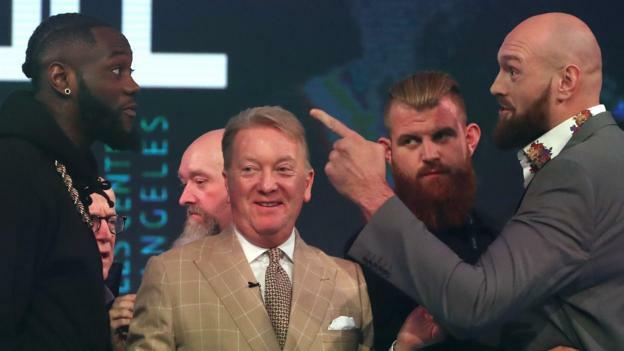 Tyson Fury says WBC heavyweight champion Deontay Wilder “doesn’t have anything I’m afraid of” before their world title fight in Los Angeles. The Briton faces American Wilder, 32, at the Staples Center on 1 December in just the third fight of his comeback. Fury, 30, vacated his WBO and WBA titles in October 2016 to focus on his treatment for depression. “If I can come back from mental health problems and [contemplating] suicide, I can withstand anything,” he said. The pair had to be separated after confronting each other at Monday’s news conference in London. Fury beat Wladimir Klitschko in November 2015 to become the lineal champion and remains undefeated after 27 fights, while Wilder has won all 40 of his fights – 39 by knockout. “It’s a dare to be great move,” Fury added. “Two fights, 10 fights – it doesn’t really matter. I can’t lose this fight. Wilder described the bout as a “mega fight”. “You’ve got two different personalities, two guys that are so charismatic and filled with energy that emotions sometimes get the best of each other,” added the American. Monday’s media activities started a three-day press tour, which continues in New York on Tuesday and ends in Los Angeles on Wednesday. Next articleYou should do your holiday shopping now. Yes, now.